Sets in Swift are powerful. They’re similar to arrays and dictionaries, but also very different… The Set collection type is an interesting aspect of Swift programming. Let’s find out how you can use it! 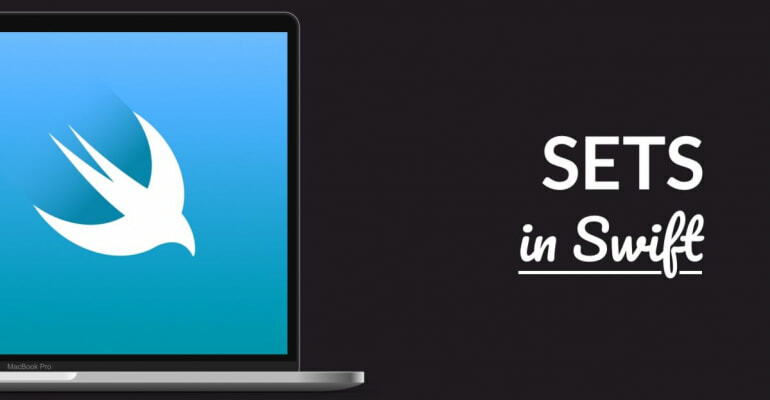 Let’s first discuss how you can work with Set in Swift. Creating empty sets, adding and removing items – it’s very similar to working with arrays and dictionaries. In the above code, we’re creating a new set called fruit using literal syntax. The type Set is explicitly provided. Otherwise we’d create an array, because of type inference. In the above code, an empty set is created using initializer syntax, with Set<String>(). You’re providing the type of the Set, followed by parentheses (). Then, an item "pineapple" is inserted into the set. Sign up for our iOS development course Zero to App Store to learn iOS development with Swift 5, and start with your professional iOS career. Sets are similar to arrays and dictionaries, but they’re also very different. An array associates numeric indices, i.e. 0...n, with values. Arrays have a fixed, consecutive order. A good example is an list of your favorite movies, ordered from most-favorite to least-favorite. A dictionary associates keys with values, and keys need to be hashable, such as String. Dictionaries aren’t ordered. A good example is a highscore: a list of people’s names and their respective highscores. A set is a one-dimensional list of items, just like an array. It doesn’t have numeric indexes (like arrays), but index values that need to conform to Hashable (like dictionaries). This characteristic makes Set so special! The above code searches for "The Matrix" by comparing that string to each of the movies in the favorites array. At worst, it’ll have to iterate over each of the items in favorites to find a match. We say that the time complexity of the above algorithm is O(n), so-called linear time. That’s OK for 3 movies, but imagine how long it takes as the list of movies gets arbitrarily large. You may need to search millions of movies one by one! Computer scientists came up with a solution to this problem, called a hash table. Dictionaries use a hash table for keys, and sets use them for values. For sets, the hash table mechanism turns each of the set’s values into a unique string, called a hash. Based on some arithmetic, this hash corresponds to the memory address of an item in the set. As a result, we can find any item using its hash, without needing to search through every item in the list. That lookup operation has a time complexity of O(1), called constant time. This idea is revolutionary, because it means we can efficiently find any item in the collection. Why not use an array? Looking up an item in an array is also an O(1) operation. You need to know an array’s index number to look up an item, which isn’t always practical. Why not use a dictionary? Looking up an item in a dictionary, by its key, is an O(1) operation. A Set is similar to a dictionary in this regard, except that you don’t have to provide hashable keys yourself. In a dictionary, a pair’s key isn’t based on its value. In the above code, we’re creating that same movies collection as a Set of strings. With the contains(_:) function we check if the string "Rocky" exists in the set. When that’s true, some text is printed as output. The contains(_:) function uses the hash table mechanism. It calculates the hash value of the string "Rocky", and uses that value to directly access the item in the collection. If there’s an item for that hash value, contains(_:) returns true. If it doesn’t find anything, we can be certain it doesn’t exist in the set. The big difference is the mechanism used to find items in the collection. An array will need to inspect every item in the array one by one. A set can directly access the value based on its hash, without the need to inspect the entire collection. The time complexity of a set’s contains(_:) function is O(1) (documentation). The time complexity of an array’s contains(where:) function is O(n) (documentation). But… what if you want to keep a list of favourite movies, and find out if a movie is contained in that list? Movie names aren’t enough, then. The first init() function produces an object of type Movie with all 3 of its properties name, year and rating. This initializer is typically added by default, unless you add your own initializers to a struct (or class). The second initializer init(withName:) is just there for convenience. It doesn’t construct a “complete” movie, just a stub that only has a name. The properties year and rating are set to 0. We’ll use it later on. Before we can use Movie in a set, the struct needs to conform to the Hashable protocol. We’ll need to make 3 adjustments. If they’re equal, the function returns true. If they’re not, the function returns false. The two Movie objects we’re comparing are called lhs and rhs, which stand for left-hand-side and right-hand-side. Remember math? Every equation has those two sides. We’re determining equality by comparing the name properties of the two Movie objects. We’re literally comparing the names of the movies. If the names are the same, the objects are the same. Comparing movie names is a rudimentary approach to determine if two Movie objects are equal. This excludes movies with the same name, but different release years, for example. A solution would be to compare both name and year in the == function. With this function we can provide data to the hash function. This hash function is used to calculate a hash table for the set. The function is passed a reference to a Hasher object. We’ll add the movie name to the hasher, using the combine(_:) function. It’s important that both the == and the hash(into:) function use the same properties. // Output: something like "5474910254413230307"
In the above code, we’re creating a new Movie object with the Movie(withName:) initializer. Because of how we implemented Hashable, we can use Movie objects to test membership of the set. The above code checks if Rocky exists in the movies set. This is an O(1) operation. The above code uses the sorted(by:) function to sort movies by its rating property (highest-to-lowest). The result of sorted(by:) is an array, and we’re getting the first (i.e., highest rated) item in the array with the first property. This entire operation has an O(log n) time complexity. In the above code we’re getting the index of the movie Lord Of The Rings with the firstIndex(of:) function. Just as with contains(_:), the movie is found with its index (a hash value). This is an O(1) operation. In the conditional, we’re using subscript syntax to get the Movie object from movies, and print its rating. It’s sometimes counter-intuitive to use a Set in conjuction with firstIndex(of:). Why not just put them in an array or a dictionary? Most object collections have unique indices anyway, such as objectId in Parse Server and $key for Firebase. The reason we’re using Set here is because we don’t care about the order of movies, and we want to find a movie by its name in O(1) time. Searching arrays and dictionaries by a property takes O(n) time. We could have used the movie name as a dictionary key, but that has zero advantages over using Set. When your collection requires a fixed order, use array. If you want the O(1) advantages of using Set, you can create a separate index with it. Put the property you want to search for in this Set, and make sure it “mirrors” the array with the actual objects exactly. Use the set to test if an item is contained in the collection, and the array (or dictionary) to get the relevant object. The above code isn’t unique to Set – any collection or sequence can be filtered with filter(_:). What’s interesting is that the type of top is the same as movies, i.e. Set<Movie>. The superpower of Set is that it can efficiently determine if a given element is part of a set. We call this attribute “membership”. Is an element a member of a set? 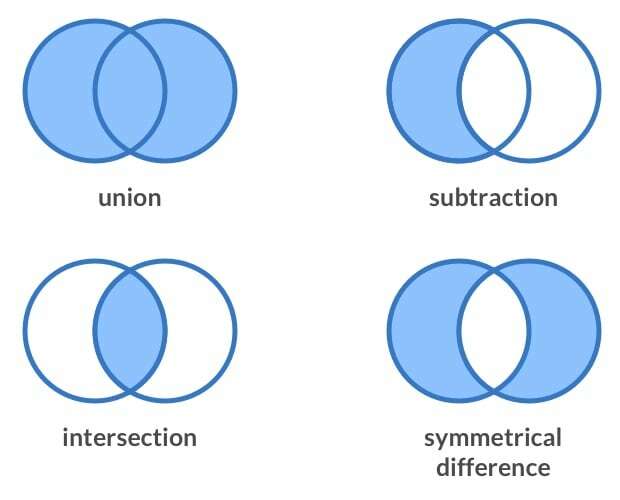 A union is a combination of sets. It’s easiest to remember as “A plus B”. A subtraction removes items from set A that exist in set B. It’s easiest to remember as “A minus B”. An intersection is a set with items that exist in both sets. It’s easiest to remember as common items shared between A and B. A symmetric difference is a set with items that exist in either A or B, but not in both. They’re items that aren’t shared between A and B. Can we find some differences and similarities between coffees? Let’s find out! For the love of coffee: The amount of espresso, milk and foam differs between a cappuccino, latte and machiato. A cappuccino and a latte both have espresso and milk. Can we also find what’s shared between all coffees? Awesome! Be careful though with chaining these operations, because the order matters. Removing "espresso" from machiato would break the chain, for example, even though "espresso" is then shared in 3 of 4 coffees. You could say that milk and water aren’t shared between these two coffees. It’s called symmetric difference because items are selected from both sets. An asymmetric difference would just be subtracting! The above examples aren’t practical, unless you’re making an app that points out differences between Italian coffees. What are some real-world use cases for comparing sets? When you’ve collected data per weekday, you could use a union to combine the data for Tuesday and Wednesday in one set. When your social media app facilitates unfriending of users, you could use subtract to remove followers for a particular user. When you want to know which followers users A and B have in common, you could use an intersection. Just like other functions in Swift, the comparative family of functions for Set has variants that perform operations in place or by returning a new value. In-place algorithms don’t take up extra space, but they mutate your original values. In Swift, most functions that operate in-place use strong verbs, such as formIntersection(), sort() and subtract(). Pfew! That’s quite some power, for a collection type that looks so simple and harmless. We’ve looked at how you can use Set to efficiently find items in a collection, and how that’s related to a hash table. And we’ve discussed how Set can help you to find similarities and differences between data points. Awesome!